One couldn’t help but hang on to every word. The silence was complete, as if everyone was holding their breath in a strange state of benevolent enchantment. 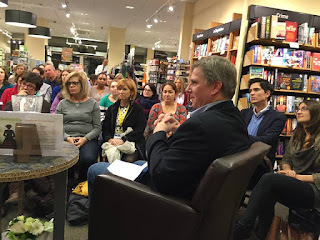 It was a talk like we haven’t experienced before: personal, meandering and deliberate, a beautifully written audiobook more than a lecture we might have been expecting. Tessa Hadley started with a confession that it was somewhat intimidating to speak to a group of Bronte lovers not being an expert on the topic, but I think after she breathed the last full stop, we were all convinced we needed more of such talks in the program. Admittedly, the uneasiness about being original and offering a unique take is somethingfamiliar to anyone tackling the mythical literary family. In fact, a hundred and fifty years after publication, dozens of adaptations, several biographies and thousands of discussions later, is it still possible to say something new about Charlotte Bronte and Jane Eyre? Is there a fresh approach waiting to be discovered and presented to our group? As Tessa Hadley argued (and demonstrated by her own example), one of the main charms of Charlotte’s writing lies in its inherent personal character. Highly subjective and yet relatable, it can evoke a myriad of meanings and represent as many things as there are readers. Of course everyone loves their witty Austen, but the Bronte stories are not written from a standpoint of detached irony, with deliberate judgement and a half-amused wink towards the audience; they are carved out of raw emotion, in isolation and darkness, solemn and organic in their oblivion. The Bronte’s wouldn’t have written with such power had they been self-conscious or auto-ironic as artists. But with both kinds, with both Jane and Charlotte, thankfully, we can read and re-read them and be captivated time and time again. In the course of her lecture, Tessa Hadley touched many important topics, especially relevant if one feels even a remote affinity towards writing and creativity, and as I was too engrossed in listening, relating, remembering and appreciating the linguistic richness, I am able to recount only a few of them from memory. But probably the most powerful point was that made about the difference between contemporary authors and their predecessors from two hundred years ago, the pioneers of the genre and their creative followers who live now. Thinking about writing as a process, one needs to keep in mind that Charlotte’s circumstances were diametrically different than those of contemporary writers. She was coming into a literary scene dominated by poetry - the noble, respected kind of writing. The novel had barely reached its adolescence at that time, and with its relatively short history was considered a largely inferior genre, destined chiefly for undignified audiences of women (gasp!) and the bourgeoisie (double gasp!). And she wrote a masterpiece of its kind, a milestone in its development. If we think of writers today, how different their situation is, how rich the background, how long the list of references for their work. If the land of novels if a map, there would be no white spots left to discover, no landmark left to be named by an aspiring pathfinder. Or, following Henry James’s metaphor, if it’s a house from which each author adopts a different point of view on the same world visible outside, there would be no new windows to look out of. But even if new writers are to tread in the footsteps of old ones, their creative task ought not to be more difficult. On the contrary, they should be more aware and consequently more sophisticated in their writing, having all these stellar precedents at their disposal in the collective imagination. In the 200 years of its existence, the novel went through a full growing cycle, and in this lifetime it created its own myths, sacred texts and stalwart figures. And like any other myths, these stories can be re-read and reenacted with no expiration date, always with a new meaning. Much like discovering new things in Jane Eyre with every new talk or book club meeting. With the privilege of the real trailblazer Charlotte, back in the early days of the novel, was able to map her own territory on her own terms (speaking artistically, not socially of course). And trailblaze she did, making the most of her instincts and setting foot first in literary devices we may take for granted nowadays. For example, her opening sentence is now a classic of the genre. There was no possibility of taking a walk that day drops us right in the middle of the situation, with no safety net of explanations or background. It’s short and unadorned but bursting with possibility. Who, where, why, and what is this sense of impersonal constraint? Such suspenseful openings abound in “new” novels, but in her time, Jane Eyre was one of a kind.Going further, as suggested by the enigmatic first sentence, the novel goes on to juxtapose subjugation and repression with passionate affirmation of the self. And throughout the printed pages, these two grind and press against each other making it, in Tessa Hadley’s interpretation, “a novel fueled by outrage”. Young Jane is an outsider, the odd one out destined to be crushed and broken to fit the mold. But she bends and twists around, anything but damaged, to emerge victorious, with all life’s gifts at her feet: independence, belonging, affection and happiness. It is also a peculiar “moral fable”, where all the crushing and bending is not protested as social injustice, but rather accepted as the impersonal status quo. In this relatively straightforward narrative, some are born luckier than others, but moral justice prevails. The Blanche Ingrams of this world will have their share of frivolity and haughty airs, but the St John Rivers will still ensure the noble advancement of England. And so, in many ways Jane Eyre is a pioneering work of the genre, unique in every way. Living in the 21st century, a writer cannot replicate the same achievement: being the first to tell the story, inventing an in medias res opening sentence, or driving an entire novel with sheer outrage (not in most countries, anyway). What they can do, successfully, is internalize the lessons Charlotte Bronte gives through her writing and treasure the tropes she gives us. They are all part of our shared heritage, a word in novel’s own private language. And while its vocabulary may be limited, one can always create new landscapes assembling and disassembling the existing elements. A contemporary writer doesn’t have to reinvent the wheel, just spin it differently. 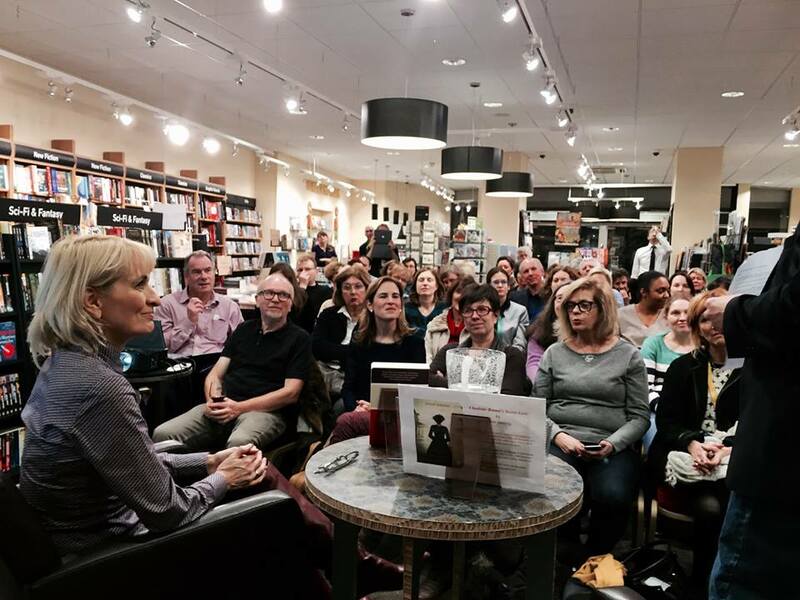 On 29 October members of the Brussels Brontë Group were among those who gathered at Waterstones for the launch of Charlotte Brontë’s Secret Love, the English translation of Jolien Janzing’s novel inspired by Charlotte Brontë’s time at the Pensionnat, first published as De Meester. Jolien Janzing, a Dutch journalist and novelist, has lived in Flanders since early childhood. De Meester, first published in 2013 and translated into English by the prize-winning translator Paul Vincent, is her second novel. It is also to be translated into German, French and Turkish. It was selected for Books at Berlinale and the film rights have been sold to David P. Kelly films. Earlier in October Jolien was invited by the Brontë Society to be their speaker at the Society’s annual literary lunch, held this year in Yorkshire. And on the morning of the Waterstones launch she was in London where she joined Claire Harman, author of the new biography of Charlotte Brontë just out, to speak on Woman’s Hour on BBC Radio 4 (http://www.bbc.co.uk/programmes/b06kggh1). They began by discussing Charlotte’s love for Constantin Heger and confession at the Cathedral of St Gudule. The first chapter of Janzing’s novel relates this scene in the Cathedral, and, interestingly, so does the prologue to Harman’s biography. At the Waterstones launch, against a backdrop of projected images of nineteenth-century Brussels, the audience listened to readings from the novel and an interview with Jolien conducted by Jones Hayden of the Brussels Brontë Group. We heard about the novel’s vision of Charlotte and Emily’s stay at the Pensionnat, with suggestions of homo-eroticism in Emily’s friendship with a fellow pupil, Louise de Bassompierre, and more than suggestions of eroticism in Charlotte’s relationship with Monsieur Heger, the husband of the school’s directress. Rather than presenting Charlotte’s love for Heger as unrequited, Jolien explores a more romantic scenario in which Heger, portrayed as a flirtatious character, is attracted to Charlotte in his turn. She shared with us her view of 1840s Brussels (described in her novel as ‘dissolute’ and evoked with great sensuousness) as a place of relaxed morals where flirtation and adultery were very much in the air. We heard about one of the novel’s sub-plots, the liaison between King Leopold I and his much younger mistress Arcadie Claret, whose destiny is counterpointed in the novel with Charlotte’s. When the liaison began, around the time of the Brontës’ arrival on the Continent, Arcadie was only sixteen. 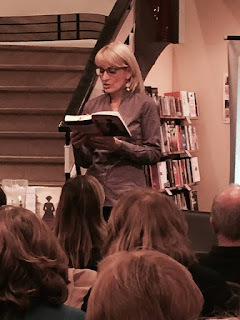 After this presentation of a book which, unusually, offers a take on the Brontës’ stay in Brussels by a writer on this side of the Channel, attendees mingled and relaxed in the approved continental style – over a glass of wine!